The cities of the Maya were the seats of power for priest-kings as well as centers for the rites and rituals of the Mayan religion. Most of the buildings in Mayan cities were government buildings, and most of these buildings were either palaces for the upper-class or temples for worshipping and offering sacrifices to the many Mayan gods. The lower classes of people typically lived outside the cities, around and on farmland. The Maya believed that over time, everything was created and destroyed many times. Mayan cities are a good illustration of this belief. The buildings that remain standing today at Mayan sites were very likely replacements for buildings torn down over the centuries. Mayan architecture is what many of us think of first when we hear the name of this ancient civilization, and it is no wonder considering the unique design and grandeur of the structures that remain today. The largest structures in Mayan cities were the temples. They towered above all other buildings and were generally off limits to the general public. The height of temples served two purposes. First, it intimidated the public and showcased the power of the kings and the gods from which they claimed to receive their authority to govern. Second, they probably were intended to serve as some sort of antenna or platform to the upper-world or heaven, as we might call it today. Temples were probably built by the farmers and slaves during the period between growing seasons. They were constructed of limestone blocks and generally had a pyramid platform with the temple structure built on top. Palaces were built much like temples, but they were not as high. Palaces generally had many rooms and sections built around at least one courtyard. Much of our knowledge of the Maya comes from hieroglyphics written on walls and temples. Unfortunately, many of the glyphs that might give us insight into the workings of Mayan civilization have been weathered away over the millennia. 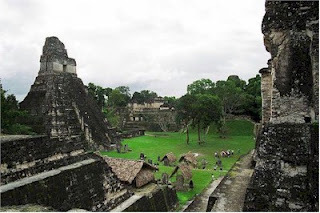 Tikal, located in Guatemala, has one of the largest Mayan building complexes remaining today. Tikal, at its height of power, had a population of 50,000 to 60,000. Tikal was probably the most populated city in the world at the time. Below are some photos from Tikal. Uxmal was a unique Mayan city. 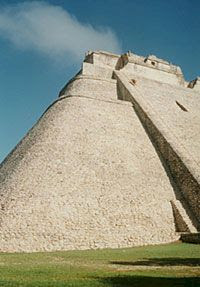 Uxmal has a pyramid built with an oval base rather than the more common square base. The buildings were of lighter color and had fewer carvings and decorations than those of other Mayan cities. Chichen Itza was the capital of the late Maya Empire.